Nintendo hardware is often targeted for homebrew, hacks and exploits, and we've seen a fair amount of them with 3DS and Wii U - attempts are also being made with the Switch. It's a relatively niche area of course, especially as Nintendo often forces modders offline by closing exploits through firmware updates. Now that the Wii U has been discontinued it's likely to be open season on mods, and one we saw on Reddit is rather interesting in that it sort of makes the GamePad similar to a Switch. Not in all ways, of course, but as you can see in the video by Yahya14 they've produced a homebrew app that allows users to switch the TV view directly to the GamePad. Most Wii U games already allow mirroring, of course, but this opens the door for games that don't give that option, such as Splatoon. It seems likely that this would be limited to offline play due to those firmware updates of Nintendo's, but it's another interesting example of how some like to experiment with and adjust Nintendo's hardware. Naturally it's still a grey area ethically and using anything like this breaks the user agreement of the system, though this particular mod doesn't seem to hurt anyone. Is this something you wish Nintendo had made possible with games like Splatoon, especially as we've now seen the game's formula shifted to a single-screen format in Splatoon 2? Let us know in the comments. That actually sounds pretty handy. I never liked being forced to look at my TV when I first got my WiiU, mostly because I actually lacked a TV. @Kalmaro I once took my wiiU to my girlfriends house. She did not have a tv either. I used a stand to prop up the gamepad and we played coop DK tropical freeze with wii remotes. I really liked the possibilities back then. But it was a shame some games did not support off tv play. "Splatoon is the obvious candidate"
To this effect, it'd be pretty sweet (and something that would never happen) if when Splatoon 2 released that Nintendo patched the Wii U game with Pro Controller support to essentially mirror the single screen experience of the Switch sequel. I'd have a lot more hours on games like Splatoon and Art Academy if this has been possible. Will have to check this out as my Wii U is still the only console connected to my main TV. I genuinely thought Splatoon already had off-TV play... not that I can remember trying... I may just be thinking of 2-player when one player would use the gamepad and the other used the TV. I would quite often press the minus button in games that weren't advertised as having off-TV play just on the off-chance, and did find that some did have the option regardless... can't remember if it worked for Splatoon though. Ohhhh, this is excellent! Another game that would benefit is Tokyo Mirage Sessions, particularly if you could switch (click) between the usual TV and gamepad displays. I will not hacking my Wii U whatsoever. I will treat it just the way it is. @singingbrakeman Just what I was thinking, I barely played Tokyo Mirage Sessions because I primarily play the Wii U on the GamePad. Do it. Instantly increases its usefulness by a massive margin. Nintendo should recognise the demand for this and just build it into the firmware. It would kill the temptation for many to go homebrew with the console. @Anti-Matter that's why I migjt I just look into getting a 2nd WiiU specifically to hack it. WiiU had so much untapped potential. Sad! @gatorboi352 The Wii U Pro Controller doesn't have a gyroscope. That's probably the most boring mod I've ever heard of. Why would you want to voluntarily give up the best feature of the whole console? I'd rather wish for a Switch hack which allows you to use the Switch display in docked mode (without using the actual dock, of course - you can hook it up via cable). One might think it gets in the way, but it is totally playable this way. @shani Although I tend to agree, but why not have the option for both? It would just add value to a fun game if I am not able to use the TV. For a moment I thought someone had gutted the gamepad with Switch hardware. About the only games I could play on the gamepad were VC games as the sub-HD display saw a lot of the colour and brightness just lost. @Hikingguy Well because most or rather all games where it makes sense already have that option (to mirror the main screen). But games like Splatoon (or to give another example: Affordable Space Adventures) rely on the second screen, so it would just make no sense to play without it. Even XCX - where you do need the second screen for fast travel and the probes - offers the option to play on the Gamepad. So that's why I don't see how it adds any value. If anything, it detracts value. Unless you can name a single Wii U game that doesn't need the second screen for anything and doesn't offer the option to mirror the main screen on the Gamepad. I wouldn't know a single game that fits that description. As a youtuber, I'd like to see it show the gamepad on the TV instead, so I could record things that are currently gamepad only. I don't think this does that, but almost. "It seems likely that this would be limited to offline play due to those firmware updates of Nintendo's..."
That struck my funny bone. 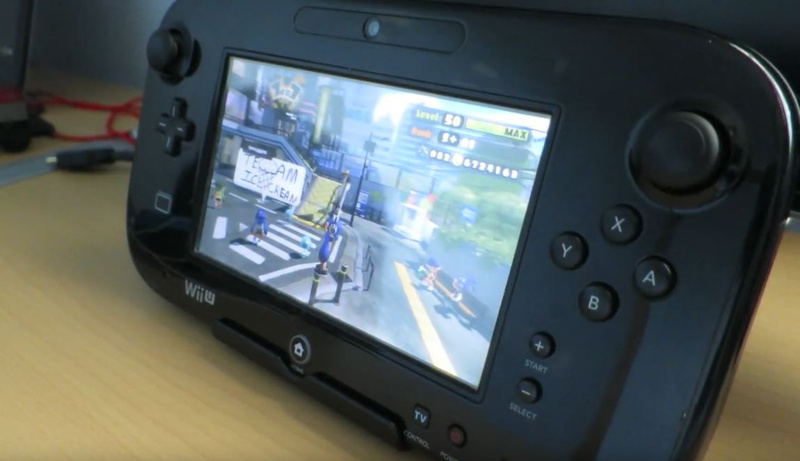 There hasn't been a new firm update for the Wii U since January 11th, 2016 (NA) and I highly doubt there is one forthcoming. @shani I always wished I could play Blasting Agent: Ultimate Edition on the Gamepad. I really enjoyed that game. How does simply having the option detract from anything? Again, I tend to agree with you, I do like having a second screen for many games. This is awesome! I freaking wish Splatoon 1 had off tv play, especially since splatoon 2 has proven that having 2 screens wasn't necessary. @Hikingguy Well I don't know that game, but I suspected as much (that there might be games I don't know where they didn't think of it) as much. @Oat: Actually, I think the opposite is true. If anything, Splatoon 2's solution (having to pull out the map and not being able to see the game) is a terrbile compromise and proves even more that you need two screen. You're totally vulnerable while pulling out the map, whereas in the first game you could take a look at the map and simultaneously keep an eye on the game itself. Also, the idea behind Splatoon originated with seeing the map/turf from above all the time. I'm totally psyched for Splatoon 2, but this is a major drawback, especially since the Switch does actually have a second screen. In my opinion, that's a really stupid decision by Nintendo. @shani at lest for me, when I shift my eyes to the Gamepad when I use the Inkstrike I usually become vulnerable anyway. So it seems pretty equal. There have been times I wished I could have somehow kept my eyes on the TV while I was launching that. Also an unlucky quick glance at the Gamepad to get an idea of the map sometimes is just enough to get my inked. But I do not know if it would be any better if there was some quick view on TV or some type of transparent overlay that would give me that same info. It seems like it might be a wash either way to me. @Nintendo_Thumb I'm a dev that works on the project. The homebrew software will in fact switch the GamePad image on to the TV when the TV image is on the GamePad screen. (in case the previous sentence wasn't clear, what you are talking about is possible). 'A grey area ethically' 😁 😁 😁. Who exactly are we harming here? THE WII U WILL BE SPECTACULAR IN THE NEXT YEAR once hackers start adding in all the features Nintendo couldn't be bothered doing. @shani Agree to disagree. I felt that with most wii u games the second screen wasn't implemented all that well. I'm a little biased since my favorite feature of the wii u was off tv play. @OatmealDome So does that mean if you were to tap the switched screens, it would tap wherever on the top? @Hikingguy Hm well then it seems we just used it differently. Before I look at the map, I always make sure I'm in a safe spot where I can't be surprised and splatted. And whenever I use the map, I only take a brief glimpse at it (a couple of hundred ms at most) and then go right back to the main screen. This way I basically can watch both screen at the same time (= less than a second). @Oat Yeah we can always do that. I'm not saying most games utilized it well, but in my opinion there were enough that did (and there would've been more if Nintendo would've gave the console proper marketing support like they're doing now with the Switch), even if sometimes only for minor features. I definitely would've enjoyed BotW a lot more if I could've used the map and inventory and quest log on the second screen. Using those on the main screen is just a real pain and distracts me from the actual game. But yeah, agree to disagree, everyone is entitled to their own opinion. @Arminillo Right now that is intentionally disabled mainly to avoid unintentional screen presses (and in the case of Splatoon, also to give a semi-accurate emulation of Splatoon 2's controls). The Wii U won't ever be updated anymore! So it's online enabled! @thesilverbrick motion controls are also not a required component of the game. @SanderEvers @gatorboi352 This is true. They work so well that I forgot there was even a dual stick option. Tokyo Mirage Sessions FE - nuff said. I'll probably hack my Wii U this year when I finish playing the backlog I have in it, to be able to replay my GC games. I've wanted to replay Rogue Squadron III for a couple of months. @thesilverbrick i tried it for 10 minutes, didn't like it, and never looked back. I've done quite well in online matches with the dual stick setup. @gatorboi352 I've heard other people who feel the same way you do, and usually they're people who play FPS games elsewhere. I'm not one to play shooters so I don't have much experience with a dual analog setup, so I just learned to play with the motion controls, which always felt intuitive to me, since I don't have much to compare them to. I'll just do a Nintendont since I don't want more devices hooked up and my brother has my GC, anyway. OH NO. The Switch is DOOOMED. But I will stand for it, i Love my Switch! I always wondered why the Wii U Gamepad didn't have a dedicated swap screen button. It would have been a lot easier for developers and players. Now, we have to go through menus etc. @OatmealDome That's great to hear. It was a bit unclear from the video and article, but, I look forward to trying it out once it's released. It sounds awesome!